A New Zealand woman has died on the Caribbean territory of Sint Maarten after the blast from a powerful jet engine knocked her to the ground. 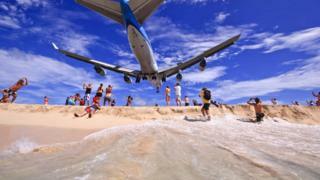 The incident happened at the famous Princess Juliana International Airport, which is just metres from the beach. Beachgoers can walk up to the airport fence as planes take off. Police said the 57-year-old woman had been holding on to the fence before the force of the jet engines threw her backwards, causing serious injury. She was taken to hospital for treatment, but died later. The particular stretch of beach on the Dutch territory is popular with tourists, partly because the planes fly extremely low over the sand before landing. The beginning of the runway is just 50m (160ft) from the fence on Maho beach, and about the same distance to the waterline. What is a jet engine air blast like? There are prominent warning signs in the area instructing beachgoers not to stand near the fence because of the dangerous air blasts. Despite the danger, a number of videos circulating online show tourists clinging to the fence to prevent being swept away - and in some cases, almost being lifted off the ground. The island's tourism director, Rolando Brison, told the New Zealand Herald he had spoken to the family of the dead woman. "I met with the family of the deceased this evening and while they recognised that what they did was wrong, through the clearly visible danger signs, they regret that risk they took turned out in the worst possible way," he said. The newspaper also said the plane taking off was a Boeing 737, a commercial jet. A number of local media reports said the woman struck her head on concrete when she was blown back from the fence line. In a statement, Sint Maarten police said they visit the area daily to discourage tourists from clinging to the runway fence. "The landing and taking off of all types and size of aircraft at the international airport of Sint Maarten is well known worldwide as major tourist attraction," police said. "Many tourists come to the island to experience the thrills of the landing of approaching aircraft flying low above their heads and the holding on to the airport fence and standing in the jet blast of large aircraft taking off. Doing this is, however, extremely dangerous."